RUSH: Here’s Robert in Norfolk, Virginia, on Open Line Friday. Welcome, sir, great to have you. CALLER: Hey, old friend. I was calling to brag on one of your advertisers. My mother’s 85, she lives in Wichita Falls, Texas, and I ordered those flowers on your flower program for Mother’s Day, and I gotta tell you the truth. I ordered ’em so they’d get there early because she’s old, and I e-mailed her to see if she received a package from me. She said, “No.” So I said, “Mom, I’m gonna call you back in two minutes.” So I called 1-800-FLOWERS program, and I said, “My mom’s expecting something. She said she didn’t receive ’em.” And they said, “They’re on the front door step.” So I call Mom back, she’s 85. I said, “Mom, when’s the last time you went to your front door?” And she said, “I never go to my front door.” She’s in a big old house, widow. So she goes to the front door, she says, “There’s two big boxes here, Bobby.” I said, “Mom, don’t bend down and pick them up. You’re gonna fall down.” So she kicks ’em in. I talked to Mom yesterday. Those flowers are still going. I doubled the order, mentioned your name. It’s not a setup call, America. I mean, it was a good day. It was a good day. CALLER: It was a good day. And when I had e-mailed ’em, my computer blew out that day, the thing is totally shot, but, I mean, they followed up. And then, about four hours later they called to see, “Did she not get ’em at the front door?” I told them the story anyway, and I talked to Mom today, and I talk to her almost every day, and she says those flowers are still going. She’s thinned ’em down to about 18 out of the two dozen. I doubled it, like I said. And she said they’re gorgeous. All her friends are jealous. RUSH: Where does your mother live? RUSH: How old is your mom? RUSH: (laughing) Part of blue-haired bloody Mary gang like my mom. CALLER: I’m telling you, she’s arthritic blue-haired bloody Mary. She’s still driving her own car. She’s talking about going into another home, but, you know what, that was good thing. That corporation is exactly what it says. RUSH: Well, you know, they’re the first, 1-800-FLOWERS is the first. They started, they owned a couple flower shops. RUSH: And they pioneered the entire overnight delivery of flowers concept. And, in conjunction with their flower shops, in many cases grow their own and come up with their own unique bouquets. And they really are great people. They’ve also got a company called the Popcorn Factory. And they make more flavors and concoctions of popcorn than you can possibly imagine. CALLER: I’ll be darned. I’ll be darned. RUSH: And it’s delicious. I think that’s out of Chicago. CALLER: I’ll be darned. Well, you know, the thing is, they did exactly what they said, and when they called me back, they said, “Didn’t she know?” I said, “Nah, I couldn’t get through to her with the e-mail, she loves her e-mail,” but I said, “Mom, do not bend down.” She said, “There are two boxes out here, Bobby.” And I said, “Mom, push ’em in somehow or get my brother over.” I got eight brothers and sisters. I said the last thing they need to do is find you out there on the sidewalk and blame me for sending you flowers. RUSH: Well, that’s great. I can’t thank you enough for that. Did you say your dad flew Phantoms? Did you mean the McDonnell Douglas F-4. CALLER: My dad flew F-86s, P-51s. RUSH: My dad flew P-51s. CALLER: My dad flew in Joe Foss and the South Dakota Air National Guard. He was his left wingman. CALLER: And my family’s from South Dakota. I was born there. I never really lived there, but he was a P-51 pilot in the South Dakota Air National Guard, P-51s. I didn’t know your old man flew. CALLER: I’ll be darned. When I was a young man I met General Claire Chennault. That was back a long time ago. RUSH: I can’t thank you enough. I appreciate that and the people at 1-800-FLOWERS are going to adore hearing the story. We go to the great lengths to make sure that sponsors here who claim certain levels of customer service actually can pull it off. I don’t want to give away our techniques in determining this stuff, but we do it. We create scenarios, like yours, and we try it. If they’re gonna claim it we want to know that it happens, and it’s fabulous news. Now, folks, for those of you who may not know what an F-4 Phantom is. If you happen to see the movie The Right Stuff, there’s a scene near the end of the movie where the actor playing Chuck Yeager steals an F-4, commandeers an F-4 and Yeager is just dying to go into space and he missed it by virtue of age. So he gets in that F-4, and, the incident didn’t really happen the way it’s portrayed. He didn’t illegally commandeer an F-4 and take off in violation of control tower authority and so forth. But the plane in that scene, if you recall, that’s what a Phantom F-4 is. F-4 Phantom. And Yeager took that thing in the movie as high as it could go. He’s flying that thing straight up. He wants to go into space and ends up having to eject. 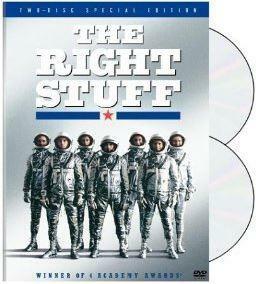 And The Right Stuff is about all the people in the space program who had the right stuff. But not that the incident is verbatim true to form, but if you remember the movie, that’s the aircraft, that’s what the guy’s talking about. I just want you to be able to visualize if you don’t know what an F-4 Phantom is, that was it. Anyway, Robert, thanks, I really appreciate it. RUSH: All right, now I’m being told that I got it wrong. It was not an F-4 Phantom in the movie The Right Stuff. It was an F-104 Starfighter. And I coulda sworn, I coulda sworn it was an F-4. I could have sworn I heard Yeager talking about that scene in the movie, claiming, “I didn’t steal an F-4.” I coulda sworn he said F-4. But now I’m being told here it was an F-104, a Lockheed, as opposed to McDonnell Douglas. Sorry for the confusion.